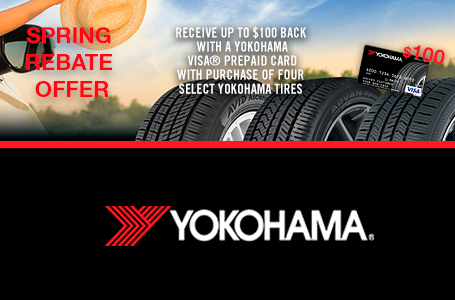 To receive your $50, $60, or $100 Yokohama Visa® Prepaid Card, submit your claim online at yokohamatirerebates.com or mail your purchase invoice along with the completed redemption form to: Yokohama Spring Rebate #YTCSPRING19, P.O. Box 9106, Farmington Hills, MI 48333-9106, postmarked by May 31, 2019. Valid for purchases made April 1 – April 30, 2019 of a set of four Yokohama GEOLANDAR M/T® G003, GEOLANDAR® H/T G056, GEOLANDAR® A/T G015, GEOLANDAR® G055, GEOLANDAR X-CV™, AVID Ascend GT™, AVID Ascend®, ADVAN Sport® A/S, or Tornante®* tires at participating locations or at Yokohama-authorized online dealers. Original Equipment lines not eligible. To check the status of your rebate, please visit www.yokohamatirerebates.com or call (877) 773-7723. 1. Limit 2 Yokohama Visa Prepaid card redemptions per household, customer or email address. Purchase must be four tires for a single vehicle. The required invoice for a second redemption per household, customer or email address must show purchase of an additional set of 4 tires for a different vehicle than the one referenced in the first redemption. 2. Late submissions will not be accepted. 3. Claims of lost materials will not be honored unless accompanied by proof of receipt of materials, such as proof of certified mailing. 4. Sponsor reserves the right, in its sole discretion, to withdraw or amend this offer in any way or to amend these terms and conditions without prior notice or obligation. 5. Offer valid only for legal US residents physically residing in the 50 United States (includes DC). 6. This offer is not valid for commercial, fleet, or employee program purchases. 7. This offer is not valid with any other Yokohama offer, except for rebates under the Friends & Family or Partner Perks Programs. 8. Void where prohibited by law. 9. Rebate issued in the form of Yokohama Visa Prepaid Card. 10. Yokohama Visa Prepaid Card is issued by MetaBank®, Member FDIC, pursuant to a license from Visa U.S.A. Inc. No cash access or recurring payments. Terms, conditions and expiration apply. 11. Allow 6-8 weeks for Prepaid Card delivery. *Available at select retail locations. Custom Wheels? We've Got Them! Quality tires from Nitto, Mickey Thompson, Bridgestone, Firestone, Cooper, Continental, Michelin®, BFGoodrich®, Yokohama, and Hankook, truck accessories, and great service is what sets Truck Outfitters apart.